‘Marketing Coach’ – and watch your sales soar! BACKYARD EXPO EVENT SELLS LOTS OF GAZEBOS! 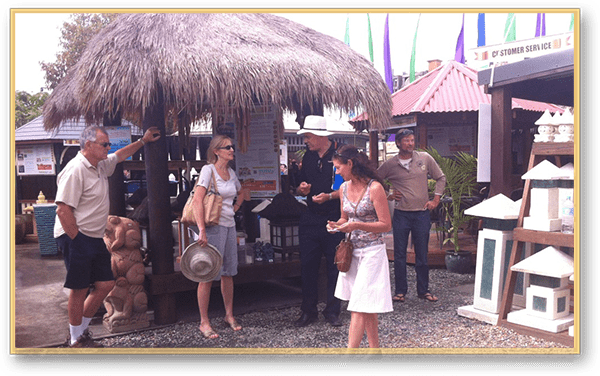 One of JD’s clients is Matt Buchel, owner of a Gold Coast business called Tropical Lifestyle. 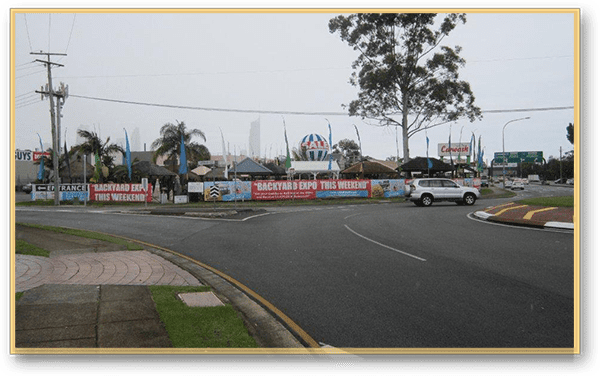 This company has been owned by Matt for a number of years and manufactures its own gazebo and Bali huts at a production plant about 30 minutes from the heart of the Gold Coast. 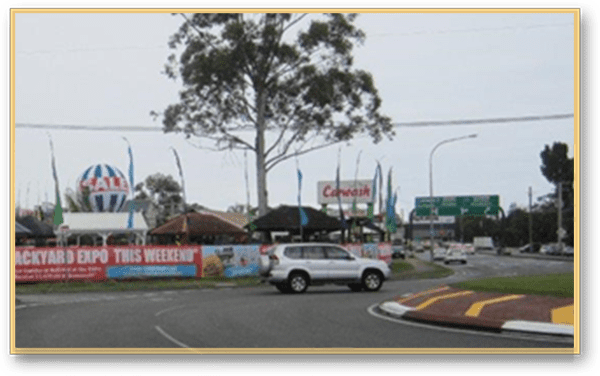 The company has a large retail centre at Bundall in the middle of the Gold Coast, located on a very busy road and therefore, enjoys massive traffic past its doors every day. Matt is an aggressive promoter and therefore markets his business very heavily both online and offline. Everyone Loves a Party, So JD Convinced Matt to Hold One! JD had been encouraging Matt to consider a Backyard Expo for some time. Given that Tropical Lifestyle featured lots of additional products outside of Bali Huts and gazebos, JD felt that an Expo would be a perfect way to showcase this. 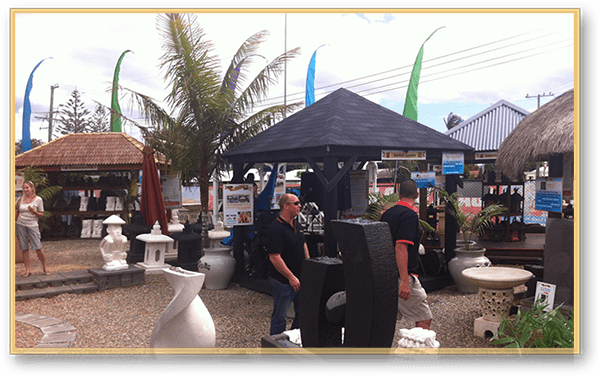 The retail outlet boasted all sorts of outdoor and backyard items, such as Balinese sculptures, barbeque settings, water features, fish ponds, granny flats and much more. The retail location was indeed “Outdoor Central” because of its wide range of furniture and garden features. JD suggested that Matt hold a “backyard themed-expo” – explaining that such a title would widen the funnel and attract more prospects. JD explained, “If Matt was to hold a weekend event which was titled “The Great Gazebo Expo,” it would draw a considerably lower number of visitors simple because of its niche nature. There are only so many people who are interested in Bali huts or gazebos at any one point in time. However, if you spread the net wider and encompass the whole “backyard theme,” there’s a much wider audience of people who are considering beautifying their backyard. 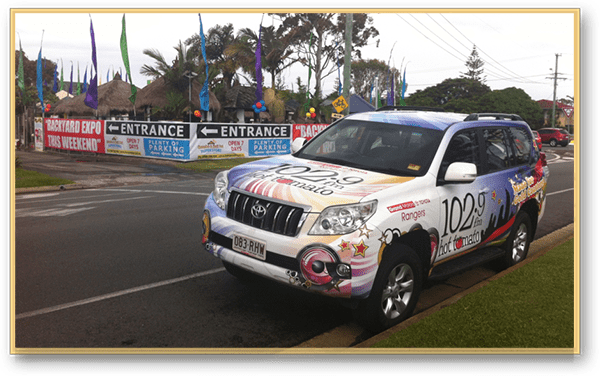 JD advised Matt to create a relationship with the Gold Coast radio station, Hot Tomato, 102.9 FM – and the station marketed the event from a week out. Then on the Saturday morning of the Expo weekend, Hot Tomato broadcast live from Tropical Lifestyle via one of its promotional vans. By broadcasting from the Expo location, the radio station was able to encourage people who were shopping to come by the Expo and see lots of fabulous ideas for their backyard! The relationship with the radio station worked a treat, with Tropical Lifestyle receiving considerably more promotional spots than what it had paid for. JD also encouraged Matt to run a $100,000 insured prize promotion, inviting people to visit the weekend event and present the letterbox brochure and receive a free entry into the draw! Around 30,000 DL size letterbox brochures were distributed to suburbs on the Gold Coast that represented Matt’s primary target audience. Part of the letterbox brochure was a $100,000 cheque, on which were the details of the invitation to gain a free entry. The result of the Expo was stunning, with the Saturday having lines of people waiting to get into the retail outlet. Matt had also cleverly arranged for family activities and treats such as pony rides, fairy floss, face painting and a Jumping Castle – with a sausage sizzle, stage entertainment and free coffee for the adults. 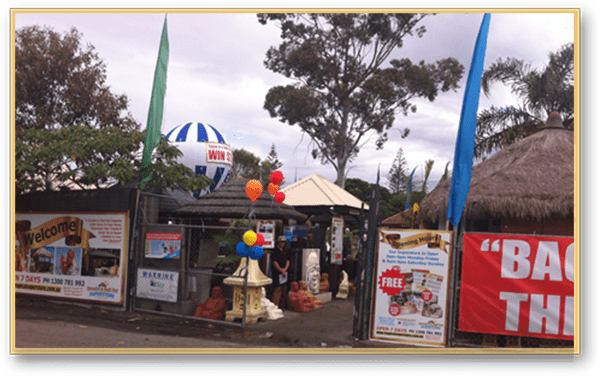 Tropical Lifestyle’s sales for just the Saturday of the weekend Expo were sixfold what a normal Saturday turnover would be! The entire weekend event was a spectacular success, exceeding Matt’s wildest expectations. Indeed, it was so successful that Matt immediately scheduled another Expo a few months down the track and is now planning three of four such events each year. Why Do Expos Like This Work? Simple – everyone loves to go to a special event whether it be a cocktail party, premiere of a movie, Special Breakfast or Expo. People are intrigued by events and gravitate towards them. Because of his $100,000 Insured Prize Promotion, Matt was able to build upon his database considerably, due to all of the entries being brought in by homeowners. (If you’re interested in gaining such huge prizes for a low cost, contact us here at The Institute of Wow and we can provide you with a Blueprint for running such promotions). “The figures speak for themselves.Before we became part of John’s “wow environment”, our annual profit was about $120,000 a year. Within 18 months of being involved with John’s coaching ideas, our profit within 18 months, grew to an annual rate of $440,000 a year! That increased the value of our business fourfold – an outstanding result! Newcastle Knights Rugby League Club. “Our sauna massage business has improved leaps & bounds since we invested in John’s advice. His “client attraction system” is incredible – we’ve followed his formula & the results have been “instantaneous!”We wish we had come across his marketing wizardry years ago – but we’re sure glad we’ve now found him. How I got TV star, Ray Martin to sell my home! Learn to deliver the “unexpected” – and watch clients comeback for more! Urban Burger With No Database!